Donor kidney exchange is an established method to overcome incompatibility of donor–recipient pairs (DRP). A computerized algorithm was devised to exchange donor kidney and was tested in a multicenter setting. The algorithm was made according to the consensus of participating centers. It makes all possible exchange combinations not only between two incompatible DRP but also circularly among three DRP and selects an optimum set of exchange combinations, considering several factors that can affect the outcome of the exchanged transplant. The algorithm was implemented as a web-based program, and matching was performed five times. Fifty-three DRP were enrolled from five transplant centers. The numbers of DRP that were enrolled in each matching were 38 (25:13), 39 (34:5), 33 (31:2), 32 (28:4), and 34 (30:4) (carryover:newcomer). The numbers of generated exchange combinations were 4:11, 3:17, 2:12, 2:3, and 2:3 (two-pair exchange:three-pair exchange), and the numbers of DRP in selected exchange combinations were six, 12, six, five, and four in each matching. The numbers of DRP with blood type O recipient or AB donor were five and one, respectively, in selected exchange combinations. Six DRP of two-pair exchange combinations and six DRP of three-pair exchange combinations underwent transplantation successfully. Computerized algorithm of donor kidney exchange was tried not only between two incompatible DRP but also circularly among three DRP. It showed that the algorithm has potential to improve the outcome of donor kidney exchange, especially for disadvantaged DRP with blood type O recipients or AB donors. 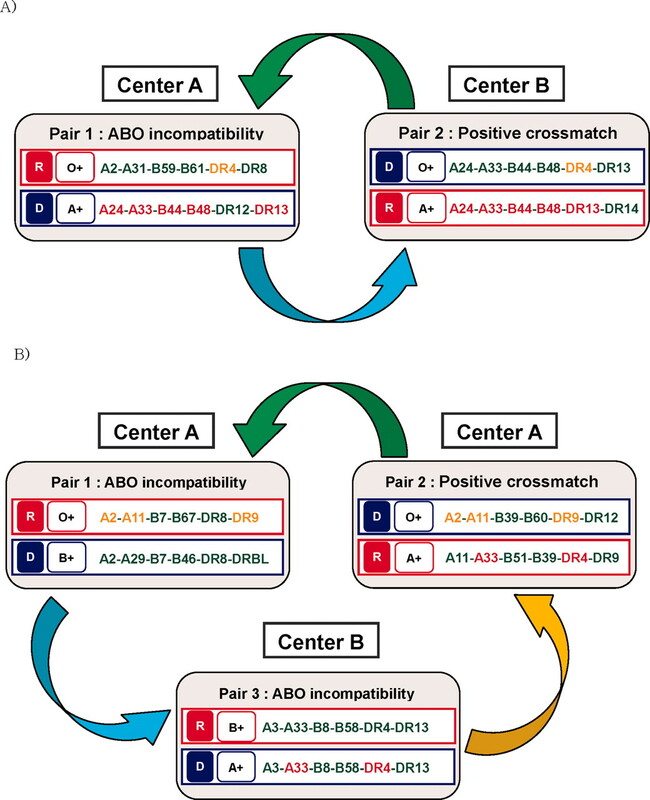 Not infrequently, incompatibility of ABO blood type or positive cross-match makes renal transplantation impossible. In an effort to overcome these problems, donor kidney exchange has been tried for almost 15 yr and now is an established method in several centers around the world (1–5). Despite its potential, it is not practiced widely throughout the world, partly because of the complexity of donor allocation in the exchange, logistic barrier, and lack of standardized protocol (4,6). Efforts to initiate donor kidney exchange programs on a local or regional scale are in progress (1–3,7,8), and computer algorithms to facilitate donor kidney exchange have been proposed (9–11). Indeed, for regional donor kidney exchange programs, which are not limited to a single transplant center, computerized methods are required to evaluate and coordinate myriad factors that are associated with donor–recipient pairs (DRP) and participating transplant centers, all of which can affect the outcome of the exchange. Recently, computerized algorithms that facilitate donor kidney exchange between two incompatible DRP and circularly among three DRP have been devised with the goal of improving the outcome of the donor kidney exchange process (11–13). We implemented such an algorithm as a web-based program and performed clinical application in a multicenter setting. Our paired exchange protocol was approved by the ethics committee of the Korean renal transplant study group, and all exchange transplants were performed under the approval of Korean Network for Organ Sharing. Informed consent for this exchange program was obtained at enrollment from each participating DRP. The algorithm for donor kidney exchange was made according to the consensus of the transplantation physicians and surgeons and the coordinators of the participating transplant centers. It makes all possible donor kidney exchange methods (exchange combinations) not only between two incompatible DRP but also circularly among three DRP, from an incompatible DRP pool (Figure 1). The exchange combinations were devised according to the following predetermined rules: (1) For all exchanges, blood type compatibility is required; (2) donors in each exchange combination should be in the same age group, which was divided into four different categories (A: 18 to 34; B: 35 to 49; C: 50 to 64; and D: ≥65), or the differences of donor age should be <10 yr; (3) for highly sensitized recipients with panel-reactive antibody (PRA) ≥50%, blood type O recipients, or the recipients with blood type AB donor, donors from all age groups are acceptable; (4) if a recipient is known to have antibodies for certain HLA, then donors with those HLA are avoided; and (5) if the recipients prefer donors with lesser HLA mismatch, then minimal requirements for HLA compatibility was the match of at least one HLA-DR or 2 HLA-A/HLA-B. Schematic representation of multipair donor kidney exchange. (A) Exchange combination with two candidate pairs. (B) Exchange combination with three candidate pairs. According to these rules, some DRP can be sorted into multiple exchange combinations. Therefore, the algorithm was devised to generate sets of exchange combinations in which each DRP belongs to only one exchange combination and all exchange combinations belong to at least one of these sets. Each set includes as many exchange combinations as possible within the confines of the rules outlined. After these sets are formed, the algorithm selects an optimal set or sets by applying the following rules sequentially: (1) Sets with the largest number of pairs with blood type O recipients, recipients with blood type AB donors, and highly sensitized recipients are selected; (2) sets that include the largest number of combinations in which all pairs belong to the same hospital are selected; (3) sets that include the largest number of combinations in which all of the pairs belong to the same area are selected; (4) sets that include the largest number of DRP are selected; (5) sets that include the largest number of two-pair exchanges are selected; and (6) sets in which the sum of all HLA mismatches between the exchanged pairs is the smallest are selected. The algorithm was implemented as a web-based program using language PHP 4(PHP Group), Pro*C/C++: 9i (Oracle Corp., Redwood, CA) and relational database Oracle 9i (Oracle Corp.). Five transplantation centers participated in the multicenter donor kidney exchange program that began in July 2005 with the protocol outlined. Medical doctors, including nephrologists and transplant surgeons; transplant coordinators; and social workers in the participating centers developed standardized protocols for donor assessment, preoperative time schedule for multicenter-based kidney exchange, and consent forms to participate in this exchange program. Demographic and clinical data of recipients and donors such as gender, age, height, weight, social security number, reason for enrollment, center of enrollment, ABO blood type, and HLA are entered into the exchange program. In addition, history of previous positive cross-match, result of PRA test for recipients, and complete results of donor screening test should be completed to be enrolled in the exchange program. We ran the exchange allocation five times. The interval between allocations was 1 mo. Each time, exchange allocation was made for newly enrolled incompatible DRP and preexisting DRP that were carried over from the previous exchange allocation. As a result of this process, an optimal set of exchange combinations was chosen and the process for donor kidney exchange then was begun. During the process, retraction of the exchange can occur for various reasons, such as positive cross-match or the withdrawal of patients from the exchange. After confirmation that each DRP agreed to participate in kidney exchange with informed consent, cross-match tests were performed between recipients and the donors to be exchanged. The donors of selected exchange combinations visited the transplant center of the recipients, and the surgical procedures in each exchange combination were performed simultaneously to avoid potential adverse outcomes. Exchange transplantation was tried only with two-paired exchange combinations in the first allocation. From the second run, transplants with three-pair exchange also were performed. Exchange allocation was carried out five times between August 29, 2005, and December 7, 2005. In the first allocation run, three two-pair exchange combinations (six DRP) and two three-pair exchange combinations were generated. However, for minimization of any unexpected adverse events, clinical workup proceeded only for the two-pair exchange combinations (preliminary allocation run), after which we performed four successive allocation runs. Table 1 shows the demographic features of the enrolled DRP in each allocation run. Because 24 DRP were carried over from a previous manual exchange program in one transplant center, recipients in blood group O were prevalent. The median age of enrolled donors and recipients was 41.0 yr (range 22 to 64 yr) and 43.0 yr (range 12 to 63 yr), respectively. The male-to-female ratio of enrolled donors and recipients was 24:29 and 33:16, respectively. The most common reason for enrollment in the allocation runs was ABO blood type incompatibility (38 DRP), followed by unsatisfactory HLA match (10 DRP) and positive cross-match (five DRP). “Spouse” was the most common intended donor–recipient relation type. Table 2 shows the outcome of each successive allocation run. In the first run, there were 24 carryover DRP that remained from previous manual allocations that took place in one transplant center. In the first, second, and fourth runs, six, 12, and five DRP, respectively, found their compatible counterparts by this exchange program, among which four, three, and five DRP completed successful transplantation. Total number of carryovers and newcomers in transplanted cases were seven and five, respectively. We limited exchange transplants of first match only between two-pair combinations to minimize potential risks of exchange among three-pair combinations. In the third and fifth allocation runs, there was no actual transplantation, although six and four DRP were allocated. Figure 2 shows the clinical characteristics of DRP that completed exchange transplantation. As of January 15, 2006, 12 DRP from three of the five participating centers underwent successful transplantation as a result of this exchange program. Among the 12 DRP, six were exchanged by the two-pair combination method, whereas the other six were exchanged by the three-pair combination method. One patient underwent successful transplantation despite having a relatively high PRA rate (47%). Two of the two-pair combination method and one of the three-pair combination method were performed in two separate transplant centers. The relationships between the intended donors and recipients were spouse in eight cases, parent–child in three cases, and sister-in-law in one case. Median waiting time between successful exchange transplantation and enrollment in this program was 4.0 mo (range 1.3 to 5.9 mo); the median waiting time between successful exchange transplantation and enrollment in any donor kidney exchange program was 4.3 mo (range 1.3 to 19.6 mo). This difference in wait time resulted from the carry over of three DRP from the manual exchange program of one center to this new multicenter exchange program. Clinical characteristics of donor–recipient pairs (DRP) who underwent successful exchange transplantation. Donors and recipients who were matched and exchanged have the same background colors. HLA in bold colors are shared between the matched DRP. N/A, not available. The reasons for preoperative retraction after allocation were positive cross-match in two exchange combinations (four DRP) and patient withdrawal in six exchange combinations (17 DRP; Table 3). During follow-up (median 306 d; range 264 to 403 d), there was no major complication or rejection in all transplant recipients and donors, except one episode of mild creatinine elevation, which was reversed quickly after a single course of steroid pulse therapy. Table 4 compares the outcomes of two different combination-size allocation algorithms. The three-pair combination limited exchange method, in which the algorithm generates both two- and three-pair exchange combinations, shows better outcome than the two-pair combination limited exchange method, both in the number and the quality of allocated exchange candidates. The former method allocated four DRP with blood type O recipients and one DRP with a blood type AB donor, whereas the latter method allocated only one DRP with a blood type O recipient. The concept of donor kidney exchange to overcome incompatibility of intended DRP was described by Rapaport in 1986 (14) and was performed for the first time in 1991 (5). After then, it has been an established method to overcome such incompatibility in several centers around the world, and for these experienced centers, donor kidney exchange is a far more simple and easy method to overcome the incompatibility of DRP than other protocols, including plasmapheresis or immunoadsorption (15,16). Some centers are even using donor kidney exchange to find donors with lesser HLA mismatch (3,4). Despite these potential, it is not practiced widely throughout the world, and the number of paired donations that are performed yearly in the United States has been <10 per year (17). This reluctance might result from complexity of donor allocation in the exchange, lack of standardized protocol, or lack of concerted effort to use it (4,6). Efforts to initiate a donor kidney exchange program on a local or a regional scale now are in progress (1–3,7,8), and in concert with these efforts, computerized algorithms for the exchange are being introduced (9–13). As participation in exchange programs by transplant centers increases, the workload that is associated with matching the exchange requirements for each DRP will increase exponentially and be nearly impossible to perform manually. Therefore, web-based programs that implement exchange algorithms are necessary for success. The program needs to evaluate not only the individual factors for exchange—blood type compatibility, donor age difference, preidentified HLA antibodies, and degree of HLA matching—but also logistic factors that are encountered when multiple centers participate in an exchange. Most of the computerized algorithms that have been reported or presented until now are based on simulated data with/without patient database (9,11–13); therefore, it is not known how they will be effective in a real clinical application. We and others have hypothesized that a computer algorithm of donor kidney exchange not only between two DRP but also circularly among three or more DRP could improve exchange efficiency (11–13). We implemented this concept, along with the consensus of five participating transplant centers about the rules to exchange donors and to select the optimum exchange methods, as a web-based program and tested the outcome in a multicenter clinical setting. Implementing and testing this concept in a real clinical situation required more sophistication than in a simulated situation. First, in addition to ABO compatibilities and HLA antibodies, which naturally were evaluated in simulated reports, we evaluated other factors when selecting suitable donors to make exchanges (see the Materials and Methods section). Second, although constructing and comparing the two-way or three-way exchange methods might have proved the efficiency of the concept in simulated reports, we needed one step further, in a real clinical situation, of selecting the optimum exchange methods for real donor kidney exchange and transplantation. This further step required another algorithm and also the consensus about the rules to select the optimum set of exchange combinations (see Materials and Methods). The most common reason for enrollment in our exchange program was ABO blood type mismatch (Table 1). Positive crossmatch has relatively low proportion. It probably is due to many blood type O recipients who have been carried over from the past manual allocation program in one center. As the number of newly enrolled patients increases, this proportion can be changed. In each successive allocation run, the number of exchanges that involve two or three DRP found by our algorithm is always larger than that of exchanges that involve only two DRP, and, consequently, the number of exchanges that involve two or three DRP that were selected by our algorithm is almost always larger than that of exchanges that involve only two DRP. These results are consistent with the previous reports with simulated data (11,12). Furthermore, five disadvantaged DRP with blood type O recipient or blood type AB donor were selected in total when the algorithm constructed and selected exchange methods that involved two or three DRP. In contrast, only one disadvantaged DRP with blood type O recipient or blood type AB donor was selected with the two-DRP only algorithm. This result suggests that our algorithm is especially efficient in rescuing such disadvantaged DRP. It is widely known that mismatch of HLA between the recipient and the cadaver kidney donor affects the survival of the kidney graft (18). In contrast, kidney grafts from living donors show superior survival compared with cadaver grafts, regardless of HLA mismatches between recipients and donors. Therefore, HLA mismatches frequently are ignored in kidney transplantation from living donors (19,20). However, there also are reports that HLA mismatch between recipient and donor affects the incidence of acute rejection or subclinical rejection on protocol biopsy, which has a potential to affect the outcome of the kidney graft (21,22). Somewhat conflicting evidence about the HLA mismatching naturally is reflected in the diverse attitude of transplant centers about requirement of HLA matching in donor kidney exchange. 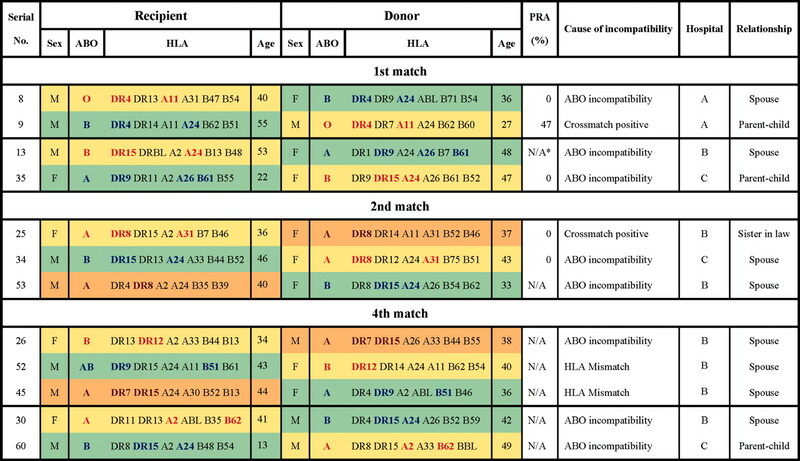 In this program, the consensus was to strive for the least possible amount of HLA mismatches between recipient and donor. However, we were unable to reach a consensus on the minimum amount of HLA mismatches allowable. One transplant center that has a long history of performing donor kidney exchange strictly required one HLA-DR or two HLA-A/B matches in the exchange (23). The other centers did not require such minimum criteria; however, in practice, recipients and physicians sometimes were reluctant to accept the exchanged donor whose HLA did not match at all with the recipient’s. These divergent attitudes were handled individually by our computer algorithm (see the Materials and Methods section). Our study has several limitations. First, the number of transplants from disadvantaged patients such as blood type O recipients still is small, although the algorithm gives priority to match these patients. Because of the low probability of blood type O donor participation in the exchange program, additional measures may be required to increase participation of blood type O donor in the exchange program. Including “altruistically unbalanced donation” in the program may be an approach to overcome this problem (24), but in this situation, thorough ethical evaluation on altruistic donor recipient pairs should be required. Second, HLA typing and PRA test were performed by each participating center. Although all the participating centers used compatible methods, a centralized histocompatibility laboratory is needed to standardize the result of tests. In our clinical experience, withdrawal rate after successful allocation was relatively high and needs to be improved (Table 3). Retraction as a result of positive cross-match between recipients and exchanged donors could have been avoided in part if HLA antibodies had been identified for each recipient, especially for those with PRA greater than 0. Other causes of retraction were due mainly to inconstancy of the patients, the reluctance to accept the exchange even though the exchange was made according to the consensus about the rules of exchange, or the hidden unwillingness to donate a kidney. These could have been avoided in part by well-informed consent about the exchange, especially about the rules and the process of exchange that is optimum for the benefit of the patients at that circumstance. However, center personnel must use a balanced approach that guards against coercion, because the retraction for reasons other than positive cross-match can be confirmed with several telephone calls to the patients and reallocation can be performed by computerized program almost instantaneously. This manuscript was presented in abstract form at the World Transplant Congress/American Transplant Congress, Boston, MA (July 23 to 27, 2006).